A broad coalition of civic organizations and public officials wants Ohio to receive $200 million in funds from the $13 billion settlement of mortgage-fraud claims brought by the U.S. Department of Justice against JPMorgan Chase. 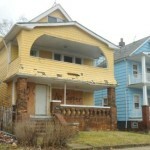 The Ohio Plan, the coalition’s proposal for the settlement funds, calls for the money to go toward the razing of dilapidated properties throughout the state, programs to prevent home foreclosure and abandonment, the renovation of blighted homes and the re-purposing of vacant parcels resulting from demolition. 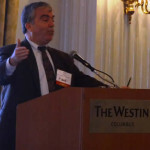 The collaborative effort was led by Thriving Communities Institute Director Jim Rokakis, a former Cuyahoga County Treasurer and a nationally recognized expert on the foreclosure crisis, and organized by Frank Ford, Senior Policy Advisor at Thriving Communities. The Ohio Plan was based on input from Ohio municipalities, counties, land banks, nonprofit community development organizations, fair housing organizations, state and federal government agencies and members of Ohio’s congressional delegation. The coalition, which includes the cities of Cleveland, Dayton and Lorain, as well as the Port of Greater Cincinnati Development Authority, worked with Steven M. Dettelbach, U.S. Attorney for the Northern District of Ohio, who is forwarding the Ohio Plan to the appropriate federal officials. Ohio is the only state in the nation to develop such a plan, Rokakis said. Coalition backers have asked Gov. John Kasich to seek support for the Ohio Plan from Jamie Dimon, chairman, president and chief executive officer of JPMorgan Chase. Dimon knows the governor from Kasich’s former career with Lehman Brothers on Wall Street. Ford said Ohio is uniquely positioned to use the funds effectively and get all the work done by the settlement deadline, which is the end of 2017. “Investment of Chase settlement funds in Ohio is appropriate for two important reasons: one, because the need for these funds in Ohio is greater than in many other parts of the country, and two, due to the capacity and expertise already in place in Ohio the Chase settlement funds can be put to use quicker, and with greater assurance of high impact,” Ford said. An independent monitor will determine if JPMorgan Chase has met the terms of the settlement. The cost of razing Ohio’s blighted structures is staggering: The cost for single-family and twofamily structures in Ohio, including demolition, asbestos remediation and administration, averages $15,000 per demolition, with mixed-use and commercial structures being even higher. At minimum, Ohio municipalities are looking at a cost of at least $750 million to remove this market-crippling blight, according to Ford. In order to resolve claims brought by the justice department, JPMorgan Chase and affiliated companies have agreed to provide $4 billion of consumer relief to remediate harms allegedly resulting from unlawful conduct by Chase. Half of that amount will go toward mortgage modifications, while the balance is to be spent on other remedies, including demolition, consumer counseling, housing renovation and repurposing vacant lots. · $144 million for demolition of dilapidated properties. Ohio municipalities are staring at an estimated $750 million bill for removal of these structures. This represents a serious health and safety threat to residents, yet these cities have nowhere near the resources needed to address this problem. Cleveland, for example, currently has less than $500,000 available for demolition and has essentially halted all demolition, holding its remaining funds in reserve for fires, collapses, and other emergencies. Without significant additional funds, Ohio cities will not be able to remove the thousands of structures that are fire hazards and havens for criminal activity. 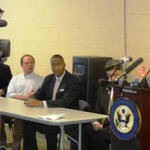 · $16 million for programs to prevent foreclosure and abandonment. Foreclosures in Ohio have slowed, but they are still four times the level they were before the crisis began. Foreclosure prevention counselors report that homeowners are often forced to make inflated mortgage payments – increased by fees, legal fees, late fees, etc. – which presents them with the dilemma of letting utility and property tax payments slip behind in order to meet the mortgage payment. The best way to deal with the blight from property abandonment is to intervene and prevent the abandonment in the first place. · $35 million for the renovation of blighted homes. Blighted homes and depressed prices have, in many instances, made demolition a more cost-effective solution than renovation. To accommodate difference between markets within the state, the Ohio Plan will allow local communities to tailor housing renovation programs to their local need. It assumes an average renovation cost of $25,000 per home – only slightly higher than the projected cost of demolition – with local communities having the flexibility to raise or lower that average based on local markets and local needs. Demolition may still be required for the majority of houses in the weaker markets, but subsidy for renovation is warranted, particularly in less-devastated housing markets and in weaker markets with careful selection of target properties. · $5 million for re-purposing vacant land resulting from demolition. Vacant land reutilization programs bring new life to the lots that remain after demolition. Successful Ohio programs include Reimagining Cleveland, which helps transform vacant lots into community assets, and the Trumbull County Land Bank’s Side Lot Program, in which lots are adopted by adjacent homeowners. According to Thriving Communities Institute officials, Ohio has developed one of the largest networks of land banks in the United States, expressly established for responding to the devastation resulting from the foreclosure crisis. 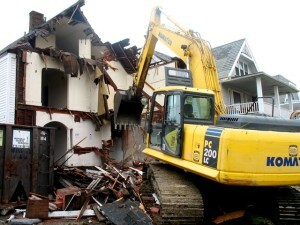 A leading example is the Cuyahoga County Land Reutilization Corporation – also known as the Cuyahoga Land Bank – which has worked with the U.S. Department of Housing and Urban Development, Fannie Mae and foreclosing lenders to acquire more than 3,500 blighted low-value properties. Although it is just a start toward addressing the areas vast problems, in the span of a few years, 740 vacant properties have been renovated and 2,400 dilapidated structures have been demolished. Ohio has an equally robust infrastructure when it comes to foreclosure prevention counseling and intervention. 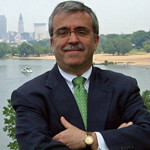 Rokakis, who was among the first to sound the alarm bells about the foreclosure crisis and was instrumental in creating the first county land bank in the state, said major cities in Ohio were hit earlier and harder than most cities in the U.S; for example, foreclosures nearly doubled in Cuyahoga County between 1995 and 2000, while other parts of the country were not hit by the crisis until in 2007. By then, national news media was already referring to neighborhoods in Cleveland as “ground zero” for the foreclosure crisis. The upside of this early experience is that Ohio communities have had more time to build and refine the foreclosure counseling infrastructure. The Ohio Plan also cites the state’s network of more than 200 municipalities and community development corporations (CDCs) that have been involved with building and renovating homes for more than two decades. In addition, over the last five years, the Ohio Development Services Agency and its programs have rehabilitated approximately 2,100 units and provided emergency home repair to about 3,700 units. The coalition also cited the state’s expertise and experience in re-purposing, or “greening,” the vacant lots created when buildings are demolished. In 2008, while much of the country was just beginning to grapple with the problem of vacant homes emerging from foreclosure, one Ohio city was already pioneering solutions for the reuse of vacant land resulting from demolition. The “Reimagining Cleveland” program, a collaboration between Cleveland Neighborhood Progress, the city of Cleveland and Kent State University, now has five years of experience repurposing vacant lots for side yard expansion, community gardens, pocket parks, urban food production, orchards, vineyards and improved storm-water runoff. “The depth of this expertise is unmatched in any other state in the country and has served as the model for other Ohio cities to undertake similar programs,” Ford said. To date, the Land Conservancy has preserved 533 properties and 38,494 acres. In response to the foreclosure crisis and its impact on Ohio’s urban centers, the Land Conservancy formed Thriving Communities Institute in 2011 and named Rokakis as its director. Thriving Communities has helped form county land banks around the state – there are now 17 – and has helped secure more than $182 million in demolition funds for Ohio communities. In addition, Thriving Communities conducts vacant property research and surveys for cities and counties, helps create urban greenways and recently launched an urban tree reforestation program.